Time for Goofy's comparison photos as he has been here 4 weeks already. His original post is here and gives some of his background history. On this, his worse, foot he has a central sulcus split to contend with which, as you can see from his day 1 photo below, was quite deep. 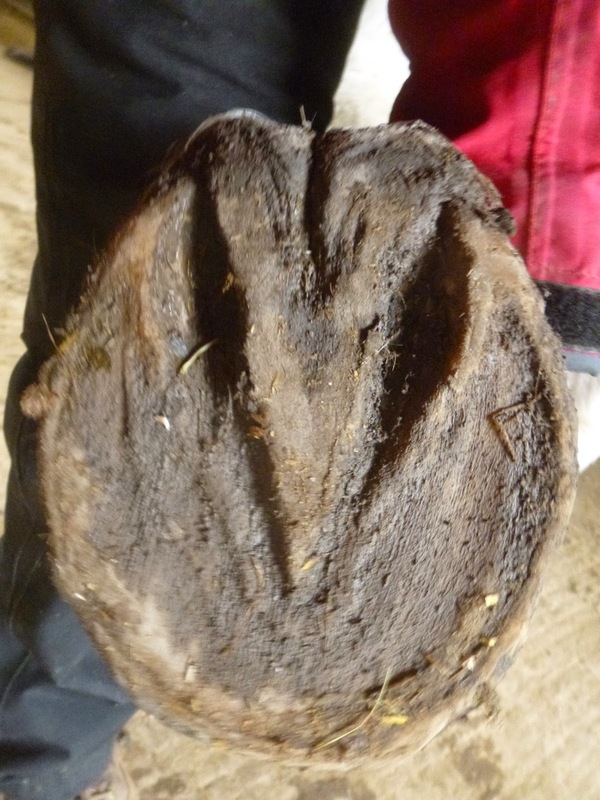 We have mostly got on top of the infection, I hope, and its starting to open up as he uses the palmar hoof more. The most interesting aspect of this shot is the much steeper angle of new growth coming in. 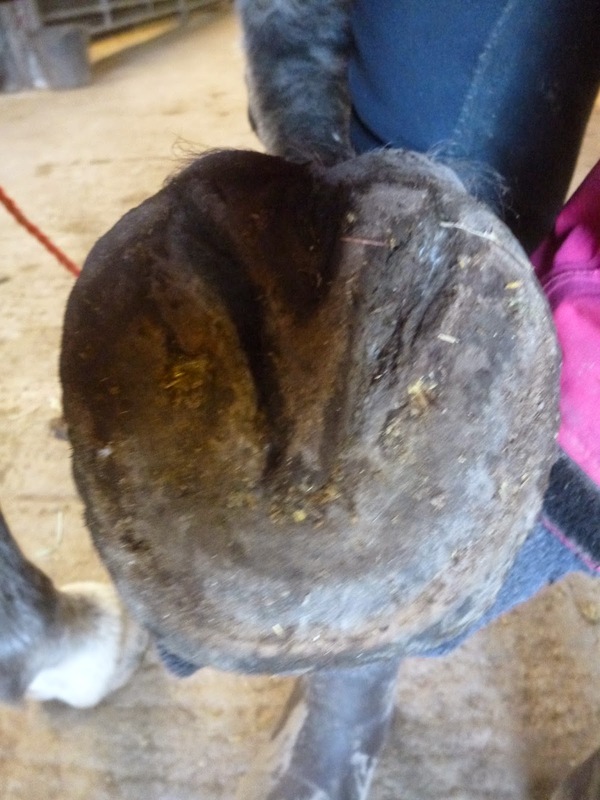 His hair is hiding it a bit but above the bulge (an old abscess hole) at the top third of the hoof capsule is new growth which will bring his toe shorter and help support the palmar hoof too once its at ground level. Not as much change on this foot which was his better one anyway but a better frog and the beginning of better concavity. More mud - sorry again - but you can at least see that the digital cushion is less pinched (the hairline is more level) in the most recent photo. A good sign as it indicates it is becoming stronger. A shorter toe and from this angle too the hairline is more level. More on Goofy soon. 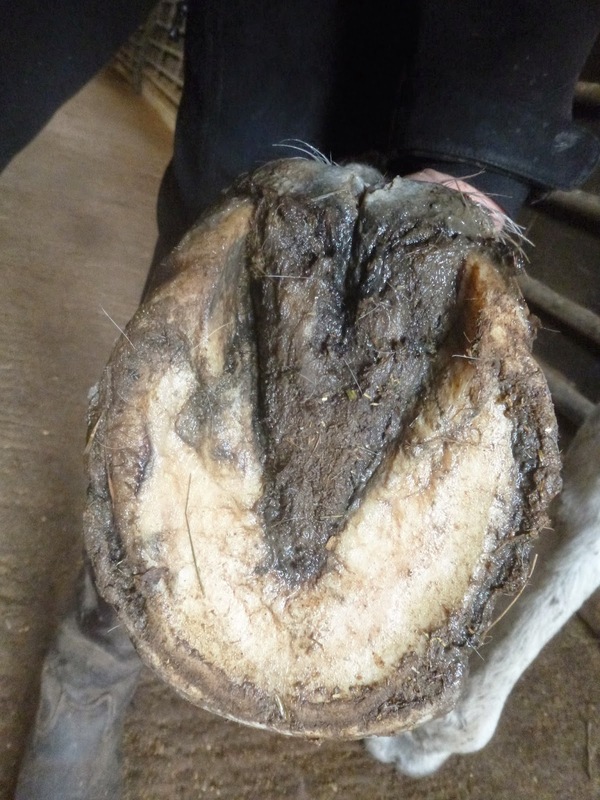 Most of you already know that the vast majority of horses who come here have been diagnosed with a lameness which blocks to the palmar hoof. On MRI this typically presents as inflammation of the navicular bursa with DDFT, collateral or impart ligament damage - often with associated navicular and coffin bone damage. 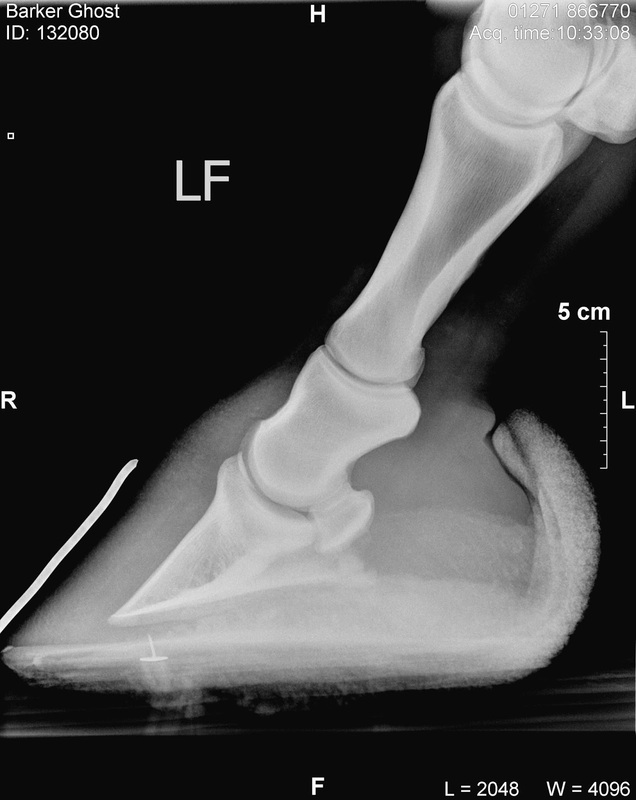 If only x-rays are available then bone damage is visible but not tendon or ligament damage (however research shows that soft tissue damage is going to exist as its always a precursor to navicular bone damage). Historically this type of condition has been described as degenerative but - for reasons I have blogged about before in this post: Surprise, surprise, not really a degenerative disease after all (which is one of the most popular I've ever written!) - I've long had my doubts about this. I described in that post how follow-up MRIs and x-rays in the few horses who have had them AFTER rehab showed encouraging signs of healed tissue and bone damage. Unfortunately till now its not been possible to perform many of these as the cost is prohibitive. However - and this is where the pie in the sky comes in - recently I've been talking to some veterinary professionals about the possibility of a new research project - this time looking at repeating MRIs on our ex-rehab horses and comparing them with the MRIs done before they came for rehab. Its possible - just possible - that we may be able in time to get funding for this as the cost of follow-up MRIs is much lower provided they are done by the same centres. There are lots of obstacles to overcome and its by no means certain that we will be able to get it off the ground but myself and the owners of the horses are as keen as mustard so its just a question of getting veterinary and academic backing...Fingers crossed! Eager's owner came to visit at the weekend and as always it was great to get the rider's feedback as to how the horse is progressing. Eager's lameness was subtle so comparing how she feels under saddle is the best way to assess how she is doing. 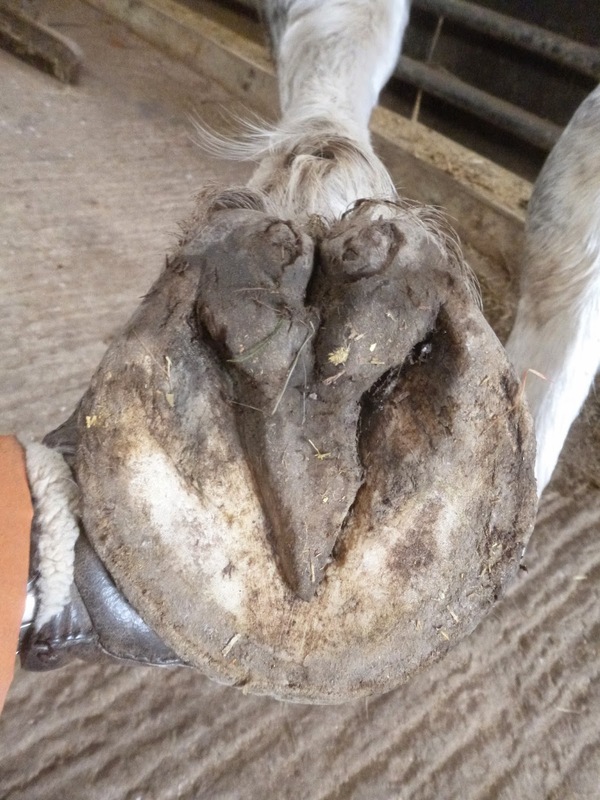 As with every horse who comes here, Eager's feet still have several months to go before they will be as strong and well balanced as they can be. 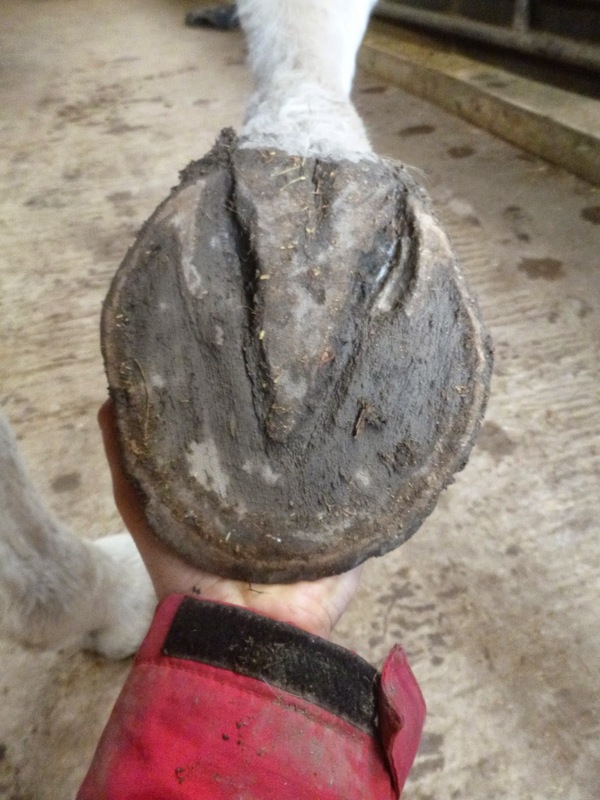 She is more confident in her landing and has half a new hoof capsule but it will be another 3 months or so before the whole hoof has grown in at the more balanced angle. 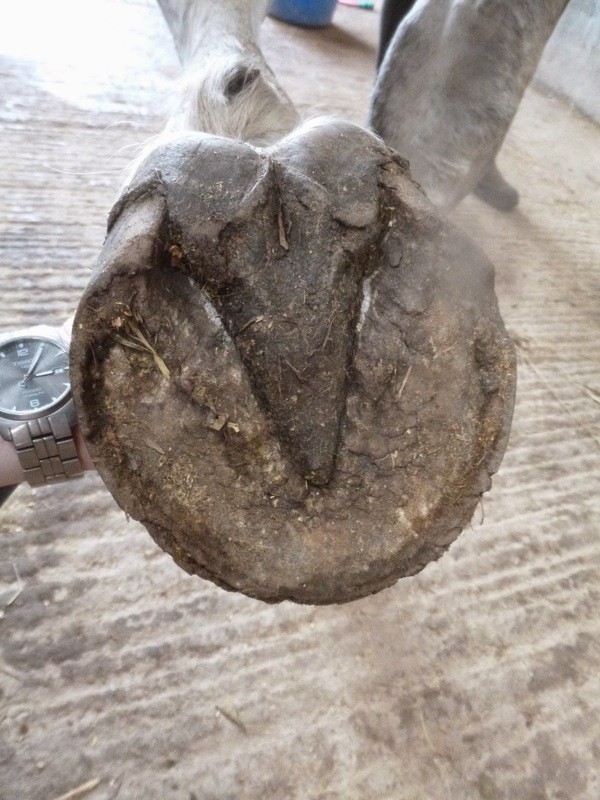 Eager already had good strong feet and as she hadn't been shod her palmar hoof was already well-developed. It has got stronger since she has been able to land better but it just goes to show that for some horses a relatively minor weakness or imbalance can be enough to cause a problem. You can see the new angle fairly clearly here - along with the amount of hoof she has grown in 6 weeks, which is impressive for any horse! 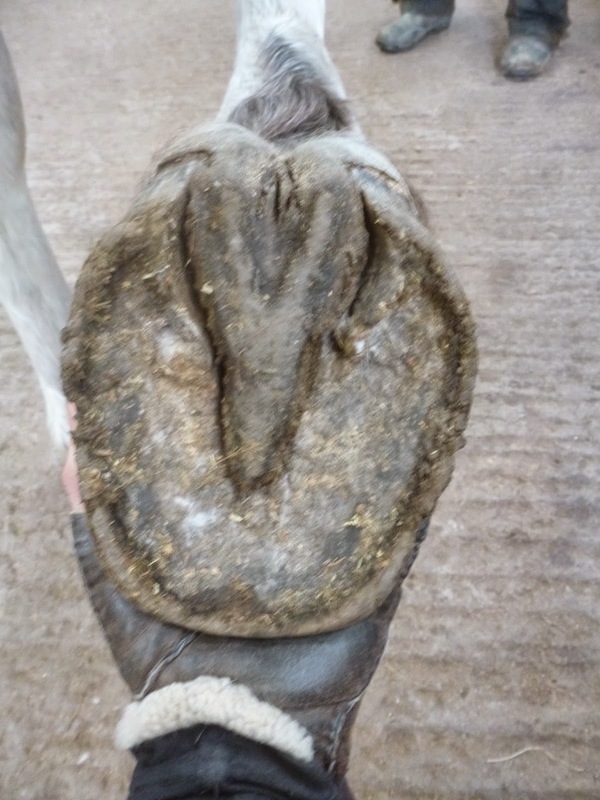 The line which was in the top inch when she arrived is now well down the lower half of the hoof - jusfor anyone who still thinks it takes 9 months to a year to grow a hoof capsule (ok, it does in shoes...!). 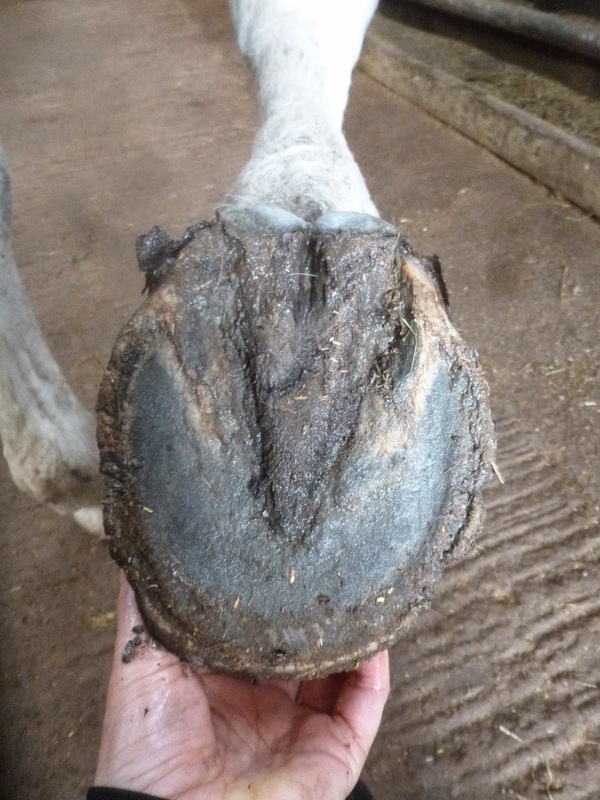 The line which was in the top inch when she arrived is now well down the lower half of the hoof - just for anyone who still thinks it takes 9 months to a year to grow a hoof capsule (ok, it does in shoes...!). Better frog, stronger heels and a clear indication of where her shorter toe will break over once the new hoof has grown down. 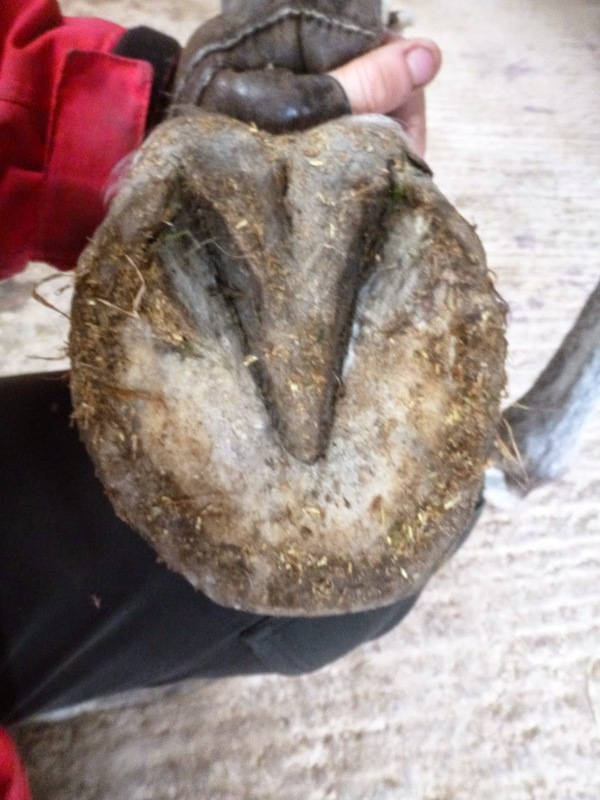 As ever, its all about a short, strong hoof wall and robust palmar hoof - the bigger the better! This isn't the best comparison shot - apologies - but again you can see the line has grown much further down the hoof and is at a slightly steeper angle. 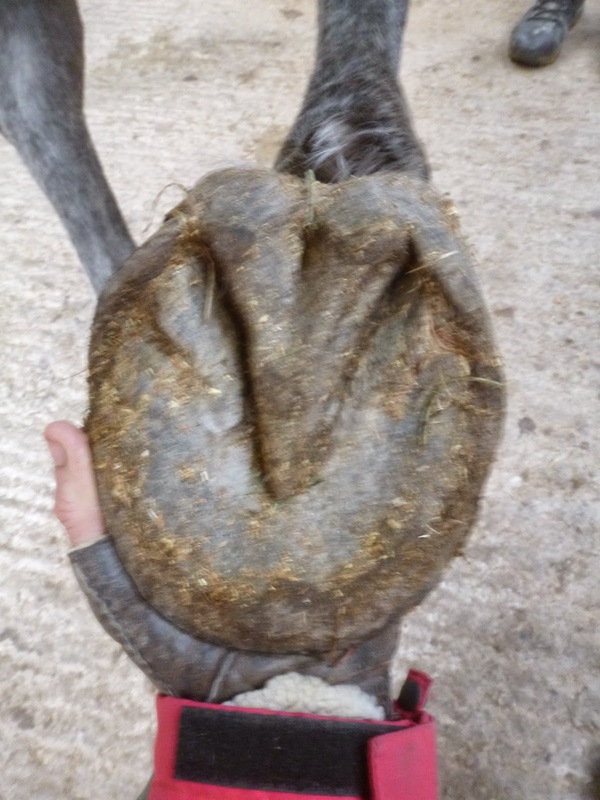 This will bring her whole hoof more underneath the limb once its fully grown in. 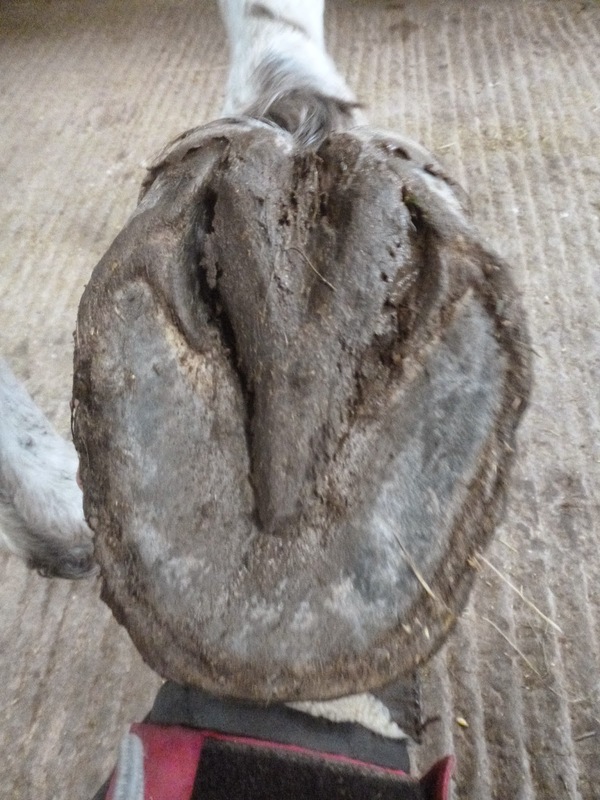 Sorry for the blurry photo but I thought you might be interested in this - its a couple of wither tracings which I have done for one of the rehab horses. The inner line shows him on 1st September and the outer line was done today. Its always interesting to see how feet improving can trigger other developments - here I suspect that a longer stride length has meant he can really swing through his shoulder and of course he has muscled up as this has happened. 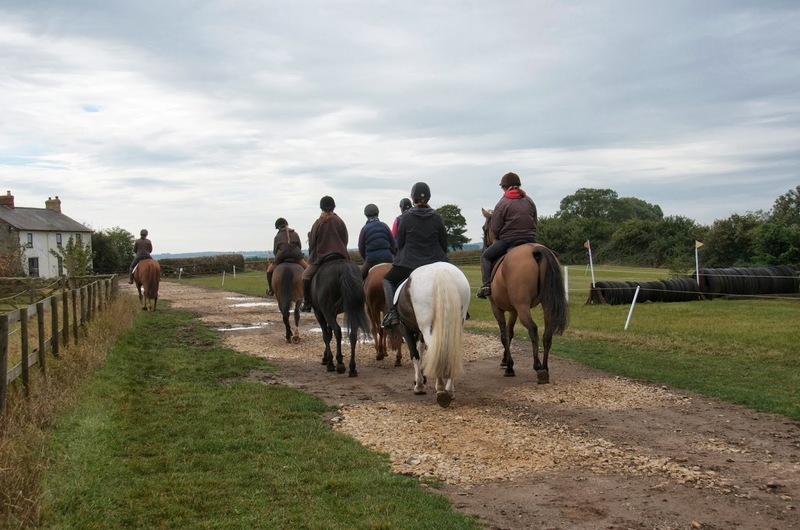 You can imagine how important it is - especially now that he has rediscovered his proper stride length and built up new muscle - for any saddle to allow this movement to continue and not restrict him in any way. 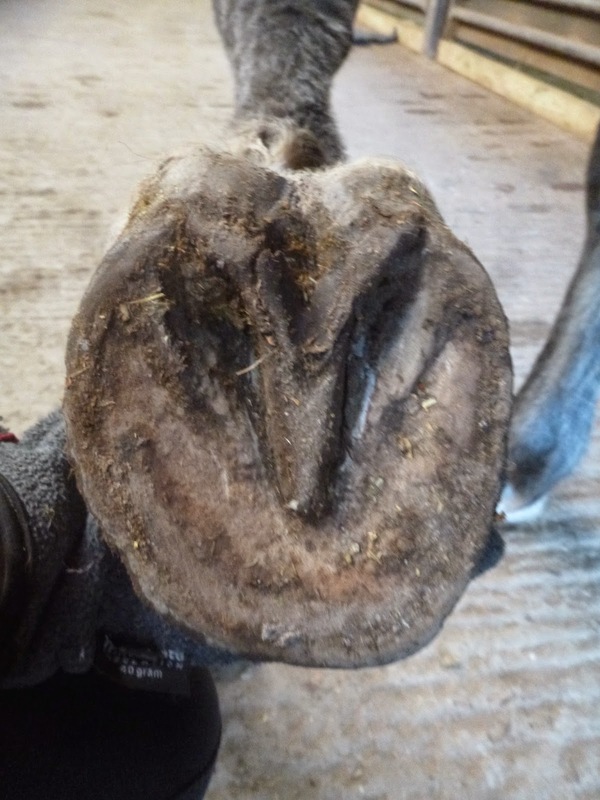 I'm quickly adding his comparison hoof photos, which cover the 12 weeks he has been here. Lucky had been out of shoes for 9 months before he came here and his feet had already shown huge improvement as I mentioned in his original post. 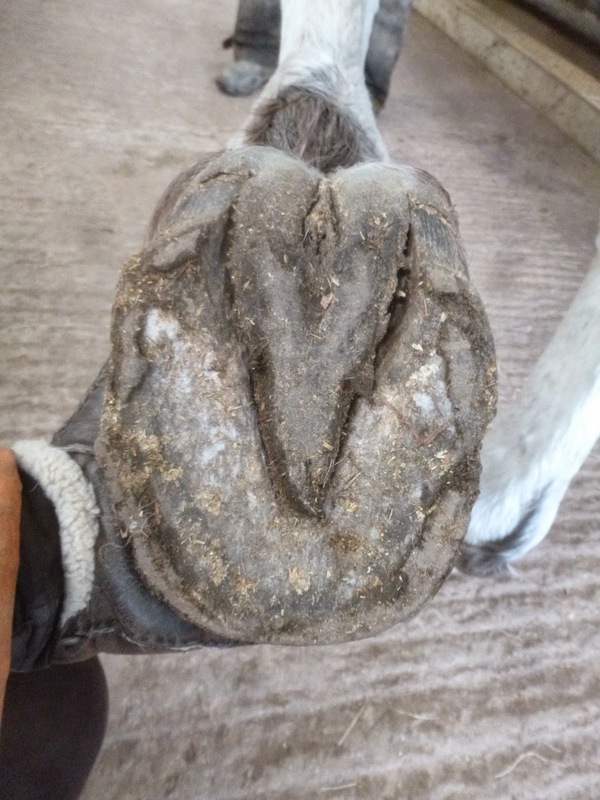 The most obvious changes are to his toe length and to hoof pastern axis - his foot is more supportive now as a result of having a stronger palmar hoof. His landing has also improved from being flat and intermittently heel first to consistently and clearly heel first. Not the tidiest frog in the world as he has shed a layer of it but its a pretty robust foot. He has lost the elongated bars he had when he arrived, which extended round his sole and his heels are also stronger. Hairier of course(!) but also a better frog - now sharing load properly with the heels instead of the heels taking the primary role, as was happening on day one. Similar changes to this foot and once the new growth hits the ground his heels will be less under-run as well. Again, good changes to the heels and bars - there is some old damage which he had on day one which has all but grown out now but that is the reason for the slightly distorted medial bar in the lower photo. 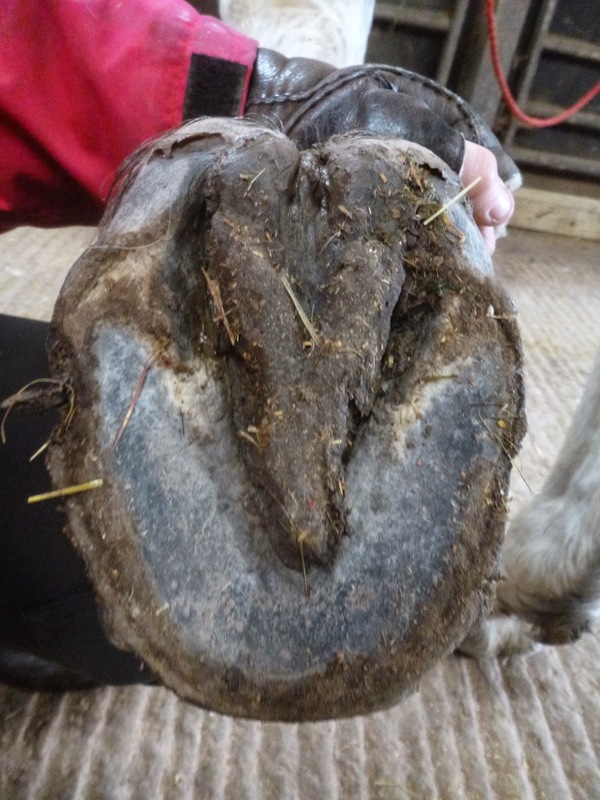 Better frog - compare the central sulcus and how the hoof wall is no longer curving in but is slightly wider than the hoof capsule at the coronet, as it should be. Alfie D has now been here for 2 weeks and so its time for an update. I'm sorry the blog is almost exclusively updates at the moment but its been so busy there has been little time for anything else, and even with perpetual updates I am only just keeping up, so I am afraid it will be like this for some time! Alfie came out of shoes a couple of weeks before he arrived at Rockley and he has clearly been keen to make changes to his feet as soon as possible. 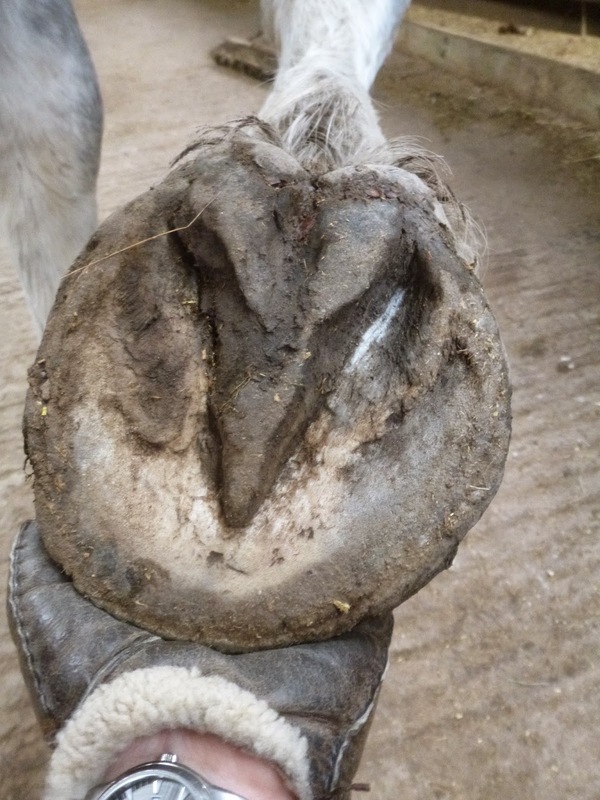 His hooves were contracted not just at the frog and heel but through the quarters as well and by comparing the same hoof 2 weeks apart you get a sense of what needs to improve. Alfie's landing in front was extremely toe-first and not surprisingly he has not yet developed enough palmar hoof strength to land better on a hard surface so we are working him on softer terrain for now. Nevertheless he is shortening his foot and it is becoming more supportive. Though its hard to see from this angle his heels are slightly less under-run and his frog is starting to get stronger as a result of increased stimulus. The changes to his RF are less dramatic but you can see that here again there is a shorter toe and stronger hoof capsule coming through. The frog on this foot has been slower to change but its beginning to de-contract. Shorter hoof wall and a beefier frog are good signs and something we should be able to build on going forward.